Once upon a time, when the earth was young, photographers determined proper flash exposures using a quaint concept called the Guide Number. It was a relatively simple concept based on several known constants: One was the relationship between brightness and distance called Inverse Square Law, and the other was the numerical relationship between the values assigned to the lens aperture size, called an F-Stop. 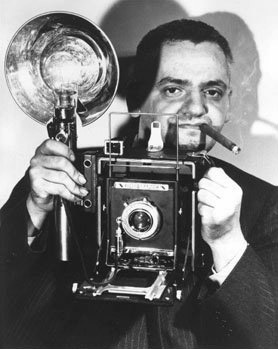 Arthur Fellig, whose nom de guerre was Weegee, was pretty typical of the on-camera flash shooters of the day. His equipment was pretty typical of the time: A 4 x 5" Speed Graphic with a flash "gun" that fired single-use flash bulbs. 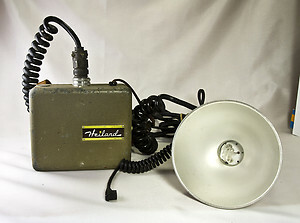 Based on my personal experience (my Father used a Speed Graphic) the cylindrical handle housed 3 flashlight batteries that produced the "oomph" necessary to light the flashbulb and power the solenoid that would physically trip the shutter. The flashgun employed a regulator that could retard the shutter until the discharge from the flashbulb reached its peak output. In use, these photographers were determining their own guide numbers based on the comparison of negatives made with a single size of flashbulb and a specific shutter speed at a specific distance while using a series of different F-Stops. Once an optimal F-Stop was determined, final adjustments were made to the amount of retard necessary to tweak the exposure even further. This process had to be repeated for each shutter speed when flash bulbs were being used, since they behaved more like continuous light sources. The equipment was temperamental, so once you got everything adjusted to your liking, you left it alone. In actual practice, the photographer loaded his camera with film and flashbulb and set the lens aperture his experiments deemed best. When his subject arrived on the scene, he would wait until the distance between his camera and the subject was the same as the one determined during his exposure tests, and trip the solenoid the make the photo. The availability of the electronic flash simplified the calibration process, but didn't eliminate it. The instantaneous nature of electronic flash exposure made the shutter retardation unnecessary, so long as the flash fired when the shutter exposed the entire surface of the film. You now had some flexibility in your choice of shutter speeds, but you still had to determine a working guide number, since none was provided by the manufacture. The literature might give some suggestions of where to start, but more often that not, the photographer was on his own. This photo of a Heiland Flash illustrates how some of these early units looked. Sorry, eBay: It was the best photo I could find. Now these values are approximate because the environment contributes to the efficiency of the flash. Making photographs in a small room with white walls will require different settings from a large, all black venue. 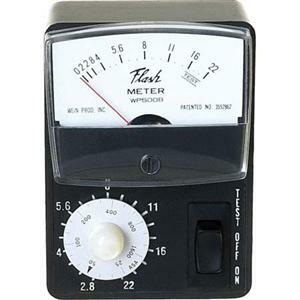 During the dark ages, you might keep an notebook listing your experiences in different environments, or you might consider getting a flash meter. Perhaps it was the purchase of my first flash meter, a Wein WP500, that gave me confidence in working with flash. Click here to follow the Adorama link where I obtained this photo. I paid $34.95 back in the early 1970's which was considered incredibly reasonable at the time. Synchro Sunlight: One challenge to outdoor lighting is trying to bring the details to the shadow areas of your photograph. Synchro Sunlight is the term used to describe the situation where you attempted to match your flash output to that of direct sunlight. Based on the Sunny Sixteen Rule, the proper front-lit exposure in bright sunlight with and ISO setting of 100 would be 1/200 at F11. By checking the chart, I find that my flash must be place 7.5 feet from my subject to match the brightness level of the sun. If I were to follow the example set my Weegie and his ilk, I would make sure that I always stood exactly 7.5 feet from my subject when my flash was camera mounted. This is somewhat oversimplified, since following this recipe to the letter will probably result in overexposed highlights and unrealistically bright shadows, so you'll need to use your judgement on your actual settings. In actual practice, you could mount you flash on a light stand place at the desired distance and trigger it using a long cable or an optical or a radio trigger. So long as the distance remains constant, you can be assured of consistent exposures so long as you give your flash enough time to properly re-cycle. An important caveat is that guide numbers provided by the manufacturer are usually very optimistic, since they are often based on exposures in small, enclosed environments. When you bring your lights out into the open, expect some major light loss. That was lot of writing to conclude that the current crop of automated, through the lens controlled flashes side step a mountain of work, and often yield a high percentage of properly exposed images. But if you are forced to rely on non-iTTL flashes, you would be wise to keep these fundamentals in mind.